Martin Padgett June 27, 2016 Comment Now! If you thought the Mercedes-AMG GT was already out of bounds--like, Guy Fieri out of bounds--the newly debuted AMG GT R must seem completely out of hand. 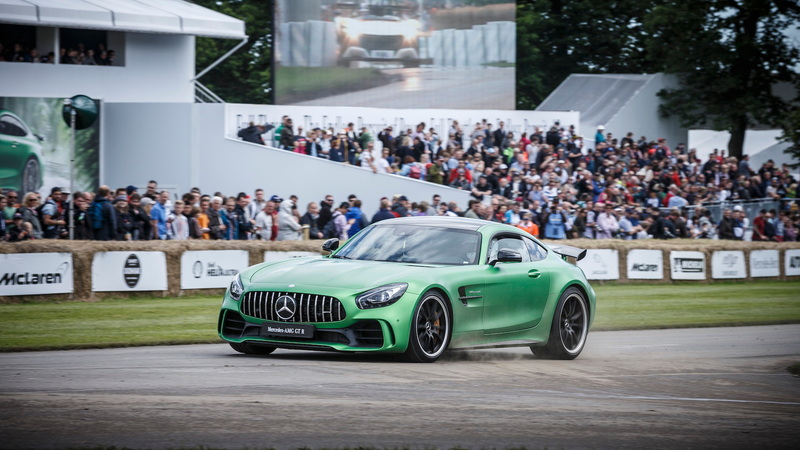 The GT R (no comment yet from Nissan on the catchy name) made its first public appearance this weekend at the U.K.'s Goodwood Festival of Speed. Held on the estate of Lord March, next to the headquarters of Rolls-Royce, this year's FoS also served as a sort of going-away party for the EU, and might one day be seen as the last place anyone ever saw so much British wealth. Period. 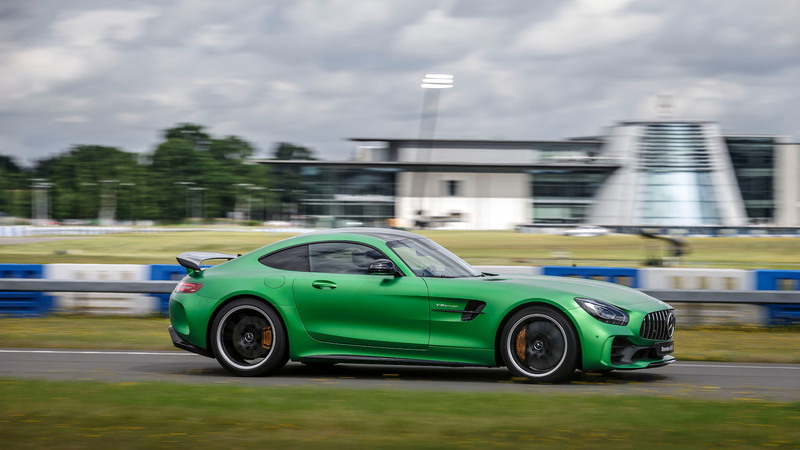 But back to the AMG GT R. The car of many letters is a track-focused special, pretty special in its distinctions from the stock AMG GT, not quite a Black Series (though we're sure that 600-plus horsepower monster is in Affalterbach's thought processes already). With better aero, more power, more ways to lay it down, and a fresh coat of caffeinated paint, the GT R has something in mind for the likes of the other GT-R, as well as the GT3 RS from Porsche, maybe even the Corvette Z06. A bodacious power bump. That's not a bun in the GT R's oven. It's an evolved version of its twin-turbo 4.0-liter V-8, with power jacked up from 500 to 577 horses in U.S. trim. All that and 516 pound-feet of torque is delivered to the rear wheels through a 7-speed dual-clutch transaxle. 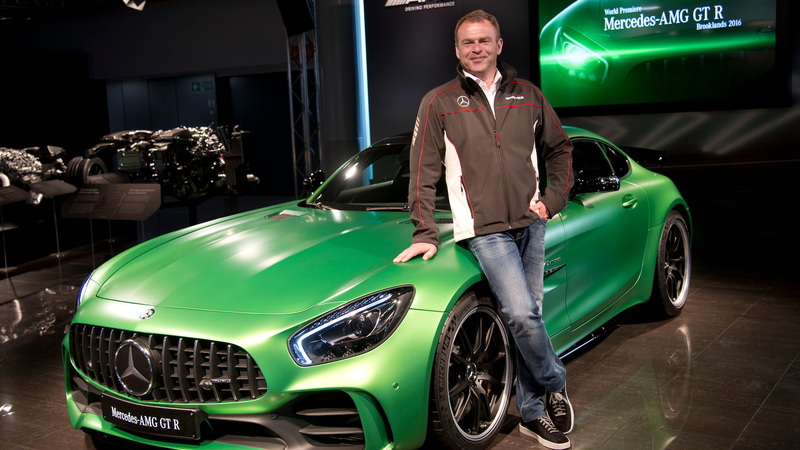 AMG says 0-60 mph times will drop to 3.5 seconds, while top speed climbs to 198 mph. A totally reworked suspension. The GT R goes all out to stick better to the planet. It has a wider track, new lightweight suspension components (everything from forged-aluminum wishbones to steering knuckles) and a coil-over suspension with adaptive dampers that can be set in "Sport" mode for endurance tracks like the Nürburgring, or "Sport Plus" for modern, flat, Grand Prix tracks like Hockenheim. Rear-wheel steering. Along with lighter-weight, staggered 19- and 20-inch wheels with Michelin Pilot Sport Cup 2 tires, and carbon-ceramic brakes, the GT R has rear-wheel steering with as much as a degree and a half of possible motion. Up to 62 mph, the rear wheels turn in the opposite direction of the front wheels, for quicker responses in tight corners. Above that speed, the steer-by-wire system puts the rears in line with the front wheels, for better stability. All the stability control modes. The GT R has a stability mode for every forward gear in a C-Class, 9 of them. The finely tuned slip control is actuated by a yellow knob on the dash, and lets the driver tailor traction to any condition, from wet and hilly to dry and flat. Active and passive air management. The GT R sports an array of vertical louvers under its grille. They can open and close in a second to let air flow freely, or to force it up and over the car, to create more downforce. There’s also a large fixed rear wing. Carbon everywhere. From carbon-ceramic brakes to a carbon-fiber cross-diagonal brace under the body, the GT R gets lots of that atom sprinkled throughout its body, for light weight and a stiff structure. The torque tube you see here? It's made from the stuff, and it's 40 percent lighter than the same piece in the AMG GT S.
A marvy new grille. 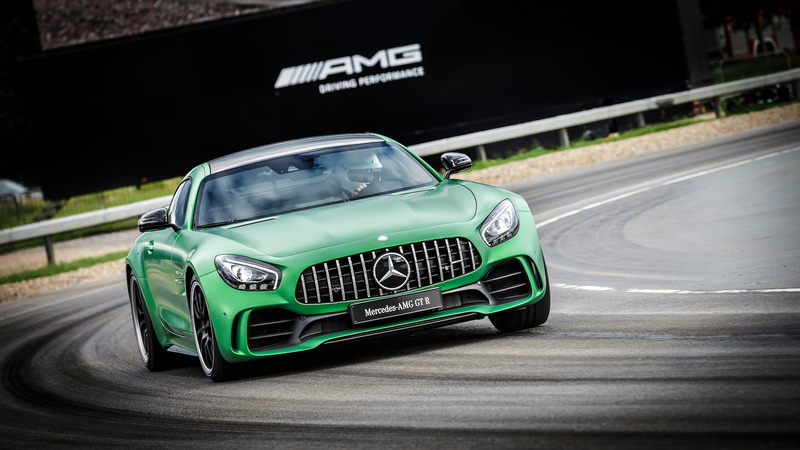 The GT R's "Panamericana" grille harks back to classic racing, but is also shared with the AMG GT3 that won this year's 24-hour race at the 'Ring. It's tilted slightly forward at its top, for a shark-nose effect that lowers the point where air stagnates at the front of the car--a good development for aerodynamic efficiency. Highlighter-yellow trim. It looks like someone was studying for a final exam inside the GT R's cabin, what with the available yellow seat belts, yellow-trimmed gauges, and the yellow stability-control knob. It smartly coordinates with the black leather and piano black trim without going too far in the Lufthansa Economy Plus direction. That acid green paint. 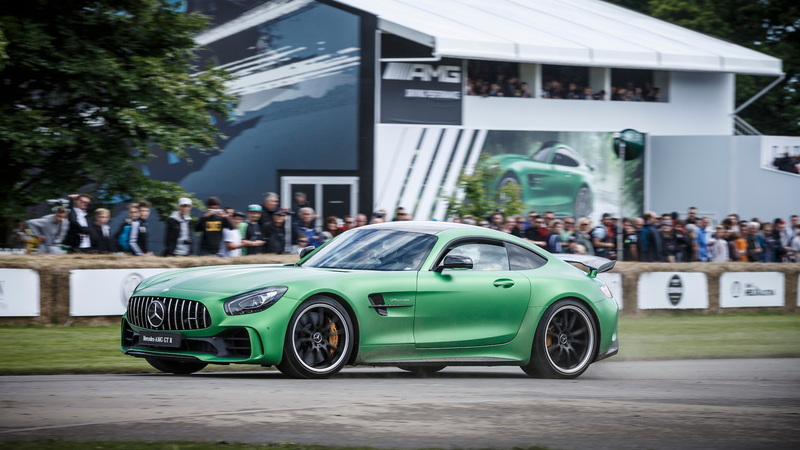 Call it AMG Green Hell Magno. That's Green Hell, aka the Nürburgring, which is where we're angling for a first shot at the GT R.